Kumar Vishwas (AAP) has done the title track shared the stage with Raj Babber & Raja Bundela-all for 3 different political parties. The music release function of DS Production “Dil Toh Deewana Hai” was held at the the view, Andheri (west) today 31 May 2016. Kumar Vishwas fo AAP has penned down the lyrics for the title track of the movie. He was present at the event and shared his experience in the film. Director Raja Bundela along with producer Deepak Sharma Co Producers Chander Shekhar Bali & Ganesh Sagar welcomed the eminent guest of Bollywood Manmohan Sheety, Depti Naval, Om Puri, Boney Kapoor, David Dhawan, Ashutosh Rana etc. Actor/Politician Raj Babbar shared the stage with his political rivals Kumar Vishwas and Raja Bundela. Also present was the star cast Raj Babbar. Zeenat Aman, Aamir Khan’s Brother Hyder Khan Sada, Alok Nath, Sushmita Mukharjee, Aroon Bakshi, Shabnam Kapoor, Hemant Pandey, Mohsin Khan, Gaurav Ghai, Gauri Sharma etc. Actor Aamir Khan Brother Haider Khan made a dramatic entry with a small performance. Veteran’s actor Alok Nath also did a small act for the evening. The Music is by Anand Raj Anand and signers include Zubeen Garg, Pankaj Udhas, Shreya Ghoshal. 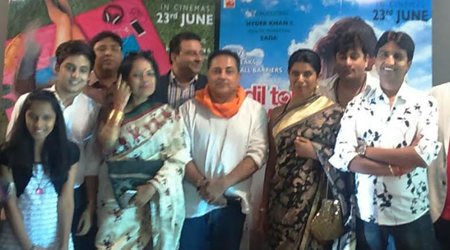 The music of film was released on Zee Music in presence of all the guests by the Zee Team. Popular RJ Anurag Pandey Hosted the event. The film is more than just a Rom-Com. It includes family, their values and overall it’s a package of full entertainment”. Said Raja Bundela, Producer of the film Deepak Sharma quoted, “Dil Toh Deewana Hai is a lesson for the new generation of Indians living abroad, spiced up with some romance and humor. “The movie has been shot in the picturesque Malaysia. Film is slated for release on 23rd June 2016. This movies revolves around Raja (Haider Khan) and Anamika (Sada). Veteran Actress Zeehat Aman Play Raja’s mother and a single paren. Raja is an introvert and shy by nature. While Anamika is arrogant spoiled and pampered daughter o one of the billionaires of Malaysia played by the Veteran actor Raj Babbar, Raja and Anamika meet in the tube in Malaysia where she is drunk and passes out and he helps her. This chance meeting leads to further meetings and he starts falling in love with her. Is the rich spoilt girl able to accept his love/ Will her rich father agree? This contemporary love story is not just about Raja and Anamika, but also highlights the life of today’s youth no matter in what country they reside, or which social strata they come from with hordes of people migrating away from their roots, their next generation is even farther from the traditional Indian values and culture. This story set against the backdrop of Malaysia Truly represents the struggle of today’s youth living abroad, their contradictions and confusion, Culture differences and clash value system. While the first generation still tries to imbibe them with traditional values the exposure to the outer world with different value system often tends to confuse the youngsters and they are left searching for answers with regards to love, values, careers and life itself. This film isn’t just for youth really, but also for those people who might have thought that they would give better life to their children by earning more money and shifting to a better pace, may be even a different country. But are they realty giving their children the “better life” they hoped for? Producer Deepak Sharma & Aradhan Shrma, Co-Producer: Chander Shekhar Bali & Ganesh Sagar, Direction Raja R Bundela, DOP Rajesh Joshi, Music Director, Anand Raj Anand & Zubeen Garg, Lyrics, Ibrahim Ashk & Dr. Kumar Vishwas, Playback Singers, Pankaj Udhas, Javed Ali, Zubeen Garg, Richa Sharma, Shreya Ghoshal, Andnd Raj Anand, Aroon Bakshi, Casting Director: D.K. Shroff, Tital Song shot by: Rishi Punjabi, Title Song written by : Dr. Kumar Vishwas & Sung by Zubeen Garg, Choreography: AI/Mel, Background score: Udhbhav Ojha, Art Director: Jayant Deshmukh, Editor: Sandeep Francis, Dialogues & Story: Vikram Sood, Associate Director: Narendra Modgil & Manav, Film Processed: Reliance Media Works Ltd., DI: Future works Ltd., Sound Recording: Hitendra Gosh, Dubbing: BR Recording, Equipments: BR Films Pvt. Ltd., Official Airlines Malaysian Airlines, Location Courtesy: Malaysian Tourism, Special Thanks to: Late Shri Tahir Hussain, Sharimati Shehnaz Hussain, Shri Ravi K.